We now have an unprecedented understanding of the cellular and molecular basis of lung function in health and disease. The lung is made of dozens of different cell types, which integrate signals from other body systems to maintain homeostasis. Although the lung has the remarkable ability to rapidly adapt to environmental stressors, compensatory mechanisms can be overwhelmed leading to disease states. Despite recent advances in the cellular and molecular analysis of lung structure and function, an integrated understanding of lung physiology is the cornerstone upon which all other knowledge rests. 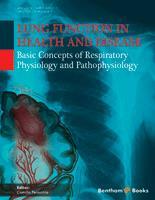 This new book fulfills this vital role and provides a step-by-step explanation of key aspects of pulmonary physiology. Written by a team of experts with decades of teaching experience, the authors’ passion for their subject is apparent from the first page. Chapter 1 provides an illuminating yet concise review of how the lung was viewed through history, and culminates in the “golden decades” of 1940-1970 when key theoretical and practical aspects of pulmonary physiology were established by pioneers in the field. Subsequent chapters cover basic principles of lung structure, respiratory mechanics, gas exchange, gas transport, acid-base balance, ventilation-perfusion distribution, control of breathing and respiration during exercise at sea level and high altitude. Although the concepts covered are not new, the authors’ experience in teaching complex concepts shines through in the numerous practical examples and detailed illustrations. This ebook will be a useful resource for medical students, residents and trainees specializing in pulmonary medicine. Whether encountering dyspneic patients in the outpatient clinic, or managing intubated patients with respiratory failure, a solid understanding of the concepts contained in this ebook will provide the practitioner the insights and confidence needed to provide effective medical care. The goal of this ebook is to present mechanistically basic concepts of respiratory function in normal and diseased states. While the book stresses the quantitative approach, more importantly it attempts to explain in detail the basic elements of respiratory mechanisms and to train students to become “clinical detectives” - a physician in the process of analyzing data from a patient’s history and lab reports should reason based on the data by determining whether abnormal values are primary abnormalities or compensatory changes, by relating each lab value to other relevant values, and by making an educated interpretation of the major abnormalities in terms of ventilation, pulmonary blood perfusion, venous admixture, wasted alveolar ventilation, tissue oxygenation, acid-base balance, respiratory mechanics, control of breathing, and so on. The present ebook is intended for first and second year medical students, as well as for residents and fellows, especially in disciplines such as anesthesiology and pulmonary medicine. In addition, this book attempts to provide a useful reference to teachers of respiratory physiology who are not directly involved in pulmonary research and/or have not been specifically trained in organ-system physiology. It is common knowledge that present faculty of physiology/biophysics departments are most often composed of cell physiologists, biophysicists and molecular biologists, many of whom have limited knowledge of organ-system physiology, while the basic needs of medical education in organ-system physiology have not changed. This book tries to fill this gap by offering to modern physiology faculty some basic tools for understanding the “nuts-and-bolts” of this major field of basic medical education. In short, the key features of the ebook are: 1. Mechanistic and quantitative presentation of most important elements of respiratory physiology and pathophysiology. 2. In-depth analysis and detailed explanation of the most relevant aspects of respiratory functions. 3. Detailed analysis of functional consequences of respiratory diseases and differences from healthy pulmonary maintenance. 4. Thorough derivation of equations used for evaluating respiratory functions in health and disease. Following the preface and a brief introduction, ten chapters cover the major subjects of respiratory structure and function, including: historical background, basic lung structure, respiratory mechanics, gas exchange, oxygen and carbon dioxide transport, respiratory regulation of acid-base, ventilation-perfusion distribution, right-to-left blood shunt (venous admixture) and alveolar dead space ventilation, chemical and neurological controls of breathing, respiratory adaptation to high altitude, both at rest and during exercise, and functional consequences of major respiratory diseases. These chapters are followed by the quantitative presentation of ten clinical cases, two tests and a case study structured for problem-based-learning. Finally, there are four appendices, which provide normal values, equations and examples of methods used for quantitatively evaluating pulmonary disorders, a list of books for further reading, and a index.